Lil' Bits "Birdsong" is a digital elements pack that you will not want to miss out on owning! The fully finished journal cards, clustered elements and sentiments make creating so much more fun as the tedious work has already been completed....all you have to do is place these elements into your creations for brilliant results. 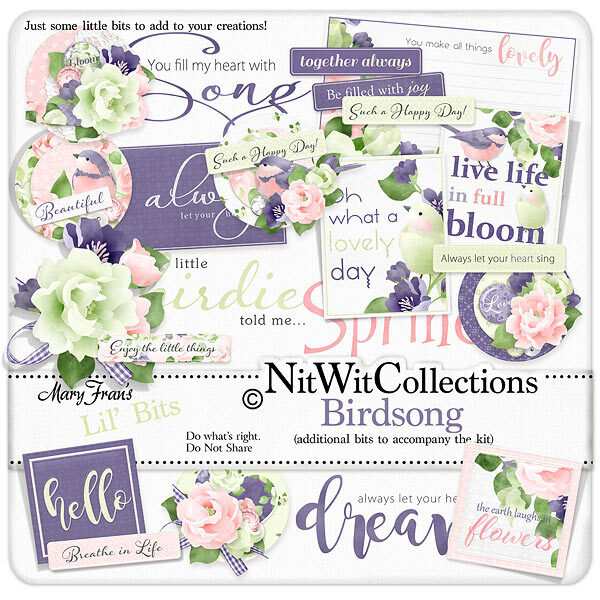 Don't miss out on these digital elements as they are not included in the FQB "Birdsong" Collection so please don't miss out on owning and creating with these elements! 1 Circular element with a sentiment - "Such a Happy Day"
1 Circular element - "Beautiful"
1 Circular element - "Bloom"
1 Journal card - "Oh what a lovely day"
1 Journal card - "Live life in full bloom"
1 Lined journal card - "You make all things Lovely"
1 Elegant pink journal card - "The earth laughs in flowers"
1 Journal card - "Hello"
1 Label - "Always let your heart sing"
1 Sentiment - "You Fill my Heart with Song"
1 Sentiment - "A little birdie told me..."
1 Sentiment - "Always let your heart dream"